Yes, you read that title correctly! I am heading to Los Angeles, California for the upcoming Thor: Ragnarok Event! While in L.A., I’ll be seeing the premiere of Thor: Ragnarok, attending a Cars 3 themed dinner to celebrate the upcoming digital and Blu-ray release of the movie, screening an episode of the new Disney Junior show Vampirina, and attending a lunch with the technology company littleBits, creators of a brand new STAR WARS Droid Inventor Kit where I’ll make my own R2D2 and bring him to life! I am so excited, and I want to share this excitement with you all! Make sure you are following me on social media (especially Twitter!) with the hashtag #ThorRagnarokEvent. During the event, Oct. 9-11, I’ll be interviewing cast members and so much more! I don’t want you to miss any of it! On the advice of my fellow Thor: Ragnarok Event blogging buddy, Tessa, I watched one of Taika Waititi’s films to prepare for this movie. I loved it! If you haven’t seen Hunt for the Wilderpeople, watch it to prep for Taika’s directing style. You won’t be disappointed! “Thor: Ragnarok” thunders into U.S. theaters on November 3, 2017! If you’ve not yet seen the trailer, you can watch it here! It. Is. Amazing! Last week I wrote a post about the Disney Pixar Cars movies. I am so looking forward to the Cars 3 themed dinner we’ll be attending, and I can’t wait to share the fun with you! The Cars 3 dinner will be at Flo’s V8 Cafe inside Cars Land at Disney California Adventure! Ahhhh! 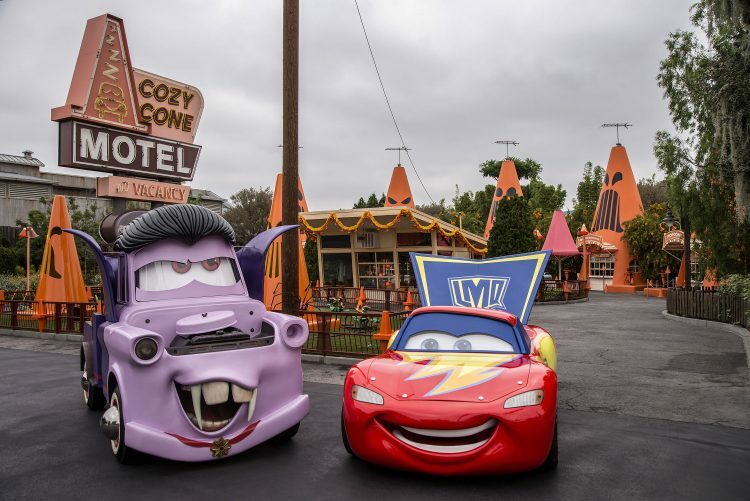 As if that were not enough, for the first time ever Cars Land will be fully decked out for “Haul-O-Ween.” I cannot wait to see it! After dinner I will be going on the Radiator Springs Racers, Luigi’s Honkin’ Haul-O-Ween and Mater’s Graveyard JamBooree! And after that, I will get to go on the brand new GUARDIANS OF THE GALAXY ride Mission: BREAKOUT! which will be themed out to Halloween with the new name “Monsters After Dark”! I can’t wait! I’m hoping for some swag to put in my “little” boy’s stocking this year! Yeah, he’s gonna be 20 in October, but who cares? I still give my kids Disney stuff every Christmas. Don’t forget to visit my other Cars 3 post for coloring pages, build your own racetrack, and activity pages. 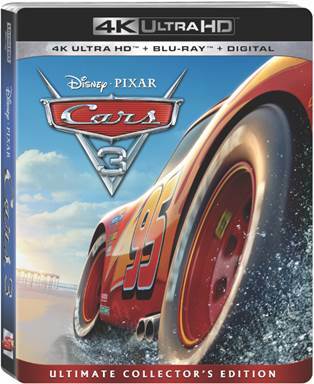 Disney Pixar CARS 3 zooms into your homes October 24th on digital and November 7th on Blu-ray. You can bet this will be under the tree this year too! 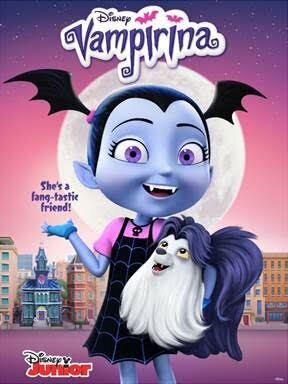 Disney Junior’s new animated series “Vampirina” premieres October 1st. It tells the story of a young vampire girl who faces the joys and trials of being the new kid in town when her family moves from Transylvania to Pennsylvania. This show is going to be so cute! Even though my daughter is in her last semester of college, she still watches some Disney Junior shows! The fact that these shows appeal to a larger audience just shows you how talented the creators of these series are. I can’t wait to talk to Chris Nee, Vampirina’s Executive Director. This kit is available for purchase now! Did you get to watch the pilot episode of THE MAYOR yet? It is so funny! 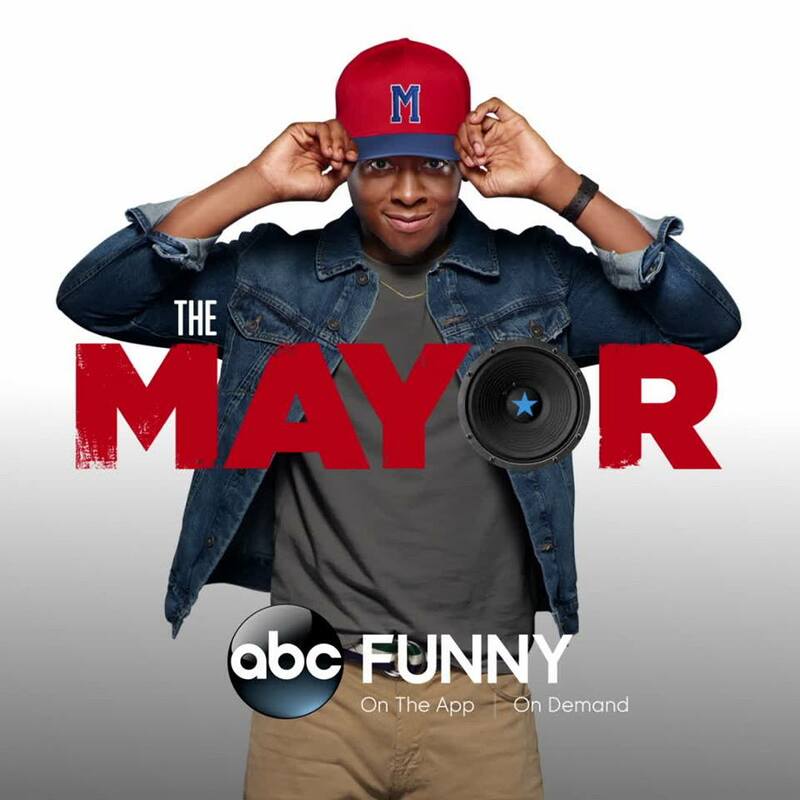 In THE MAYOR, struggling hip-hop artist runs for mayor to promote his mixtape and wins the election. On Tuesday, I’m going to screen 2 new episodes of the brand new ABC Tuesday night comedy THE MAYOR (aires at 9:30/8:30c), and I’ll meet with 2 of the shows stars Bernard David Jones (“Jermaine Leforge”) and Marcel Spears (“T.K. Clifton”). 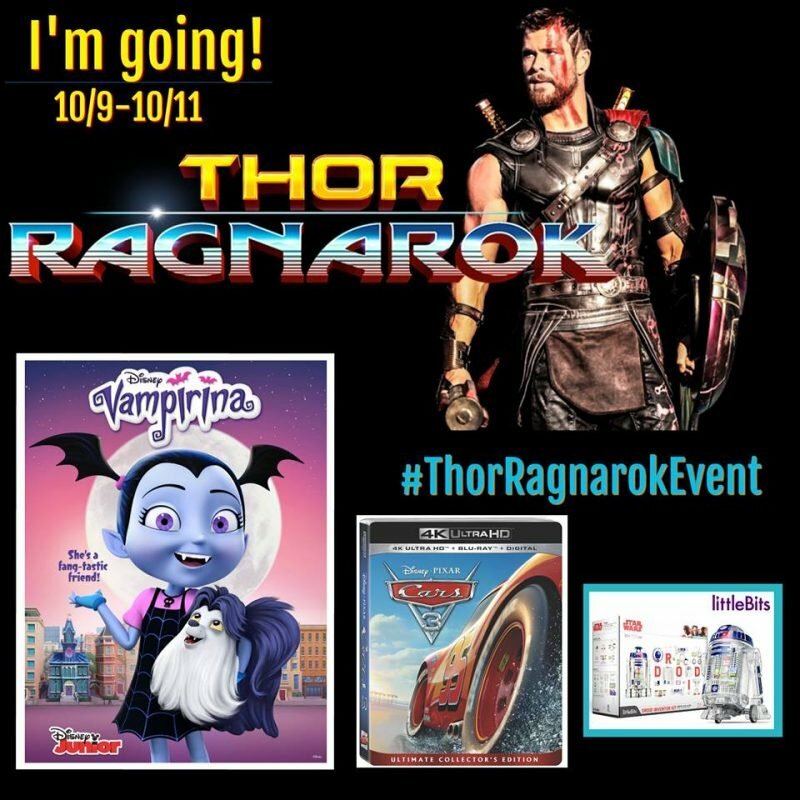 Be sure you’re following the hashtag #ThorRagnarokEvent and following me on social media for all of the awesomeness! Everything you listed excites me. Have an amazing time at the event! 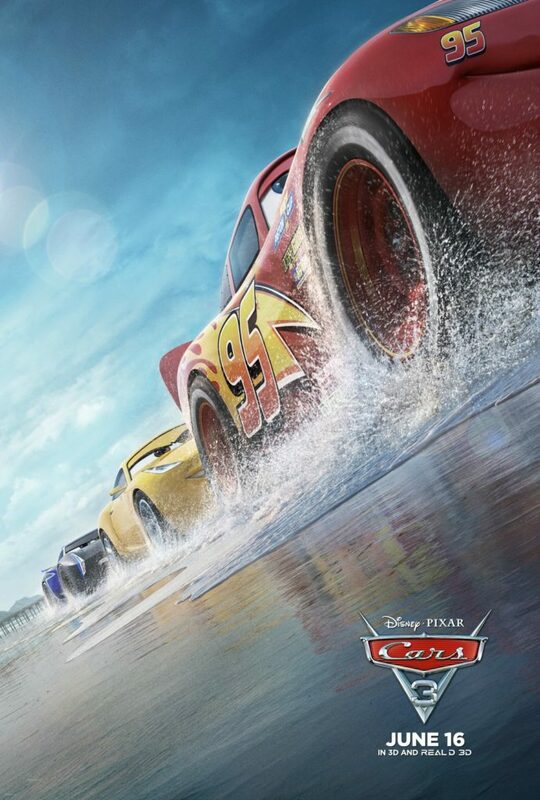 We’re going to be buying that Cars 3 DVD! You go, girl! I know you are super excited about this and I’m excited for you! What a great adventure and I’m looking forward to hearing all about your trip. Have a blast! Sounds like one event that will be jammed packed. Enjoy every moment and can’t wait to hear about your experience. That sounds like a pretty awesome event. I did not even know they were making another Thor movie. It will be exciting to see everything you do. OMG how exciting! Enjoy your event and I will be following the #ThorRagnarokEvent hashtag! My youngest and I can’t wait for the movie to come out. We go see all Marvel movies together. I was thinking she may like the DROID for Christmas since she wants to be an engineer. 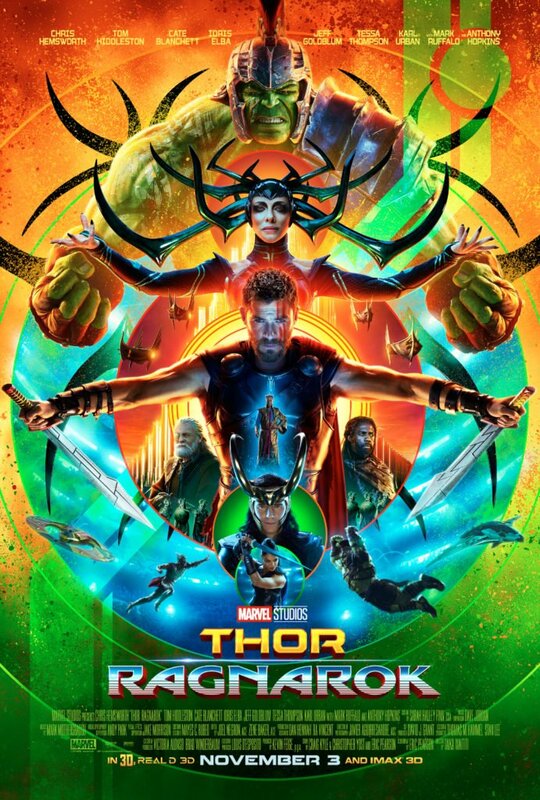 Oh my goodness what an amazing sounding event you are heading to – I’m very jealous you get to see Thor Ragnarok, can’t wait to hear what you think! I am so excited for you and wouldn’t miss it for the world! Off to count how many sleeps that is. Thanks for taking us along for the ride! Have a wonderful time. My husband would love this! I have no doubt you’re in for a grand time. I think Vampira looks adorable. Enjoy yourself! Always loved Thor. This event looks really exciting, Wish I could attend it. I’m sure that attending the Thor Ragnarok Event will be an amazing experience. My daughter is a huge Marvel fan and we can’t wait to see this movie. The Thor event sounds like so much fun! 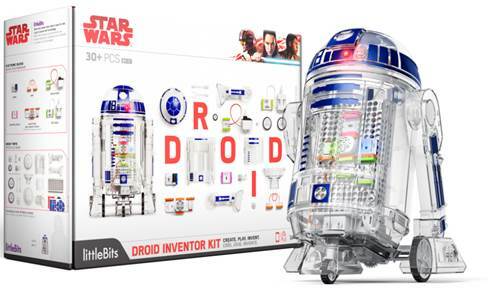 That Little Bits Droid inventor kit is adorable! My son would love that! This sounds like such a wonderful event. My kids have always loved Thor and we would love to check out this fun event. Wow, what a fun even for you to attend! I love LA just in general, there is so much to see and do. Going to this would be such an experience. Have fun! You lucky duck you! I would love to be going to that event! Have fun! That’s so cool. Can’t wait to hear from you about your trip.Enjoy. Oh what a fun event! This is going to be a blast. Can’t wait to hear all about it – enjoy your time in LA! This is the best time of year to go! That looks like you are going to have a fantastic time there. I love that build your own R2D2 as I am a Star Wars fan. Wow! Seems like a busy but super-fun trip planned out! I am so psyched to watch Thor Ragnarok too! I look forward to meeting you in LA next week! My 20-year-old daughter is already begging for Thor souvenirs. They are never too old. We do stockings each Christmas too, great idea for keeping an eye out for stocking stuffers! I am looking forward to meeting you too! We’ll have to look for awesome stocking stuffers! My kids both still get stuff like that. Molly has gotten a Disney “Barbie” almost every year. She also has tons of Disney ornaments. I’ll have to ornament shop! I am so excited to meet you and experience this with you! And I am so glad that you watched Hunt for the Wilderpeople.. SO GOOD! Me too! We are going to have so much fun! While Thor is going to be epic, I am excited also about the stuff we will be doing around Cars 3. That just sounds like so much fun! I agree! I hope to get some fun pictures of the decorations!